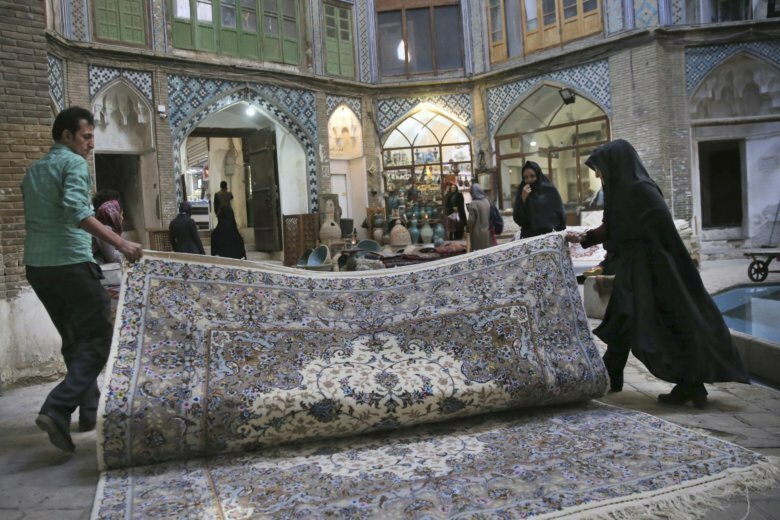 KASHAN, Iran (AP) — As the Trump administration works to unravel Iran’s 2015 nuclear deal with word powers, the producers of the country’s famed Persian carpets fear they will lose vital markets. Before the U.S. withdrew from the deal and began restoring crippling sanctions earlier this year, the $425 million a year industry preserved an ancient tradition while providing much-needed income to Iranians as well as Afghan refugees, who create much of the more luxurious hand-woven pieces. Iran produces some 400 tons of carpets a year and exports 80 percent of them. Despite the decades of mutual hostility stemming from the 1979 Islamic Revolution, the United States is one of the biggest markets for Persian rugs, accounting for more than a quarter of all exports. But that is set to change as the U.S. imposes what it says are the toughest sanctions in history, aimed at persuading Iran to dramatically change its policies in the region, including its support for militant groups and its involvement in Syria and other conflicts. The impact of the renewed sanctions is being felt in the grand bazaar of Kashan, an ancient city in one of Iran’s main carpet-weaving regions, known for its rich red, blue and yellow designs. On a recent day, many of the shops were closed and there were few shoppers. The sanctions have fueled an economic crisis in Iran, where the currency has plummeted in recent months, wiping out people’s life savings and sending prices soaring. The few tourists who visit Iran cannot use foreign credit cards because of U.S. sanctions on banking, making big purchases difficult. Mahmoud Morshedi, a carpet seller who has worked in the industry for more than four decades, said the production of hand-woven rugs was already suffering from the growing popularity of cheaper machine-made carpets. His company only produces around 20 hand-woven carpets a year, down from 100 in the 1990s, when they filled orders from local exporters, Tehran businessmen and wealthy buyers from Gulf countries. “They are not coming anymore,” he said. A small, 1.5 square meter (16 square foot) rug can take between 18 months and four years to make, and sells for up to $6,000. Iran is barred from exporting anything directly to the United States, and traders can only ship through third countries if they conceal the origin of the product. Javad Esfahanian, whose family runs one of the oldest carpet-making businesses in the country, said the industry is only able to survive because of cheap labor from Afghan refugees — mainly women — who have the rare skills required for luxury weaving and who will work for as little as $1.50 per day. He estimates that some 2 million people work in the industry and another 8 million rely on their income. But the worsening economic conditions in Iran are already pushing Afghan refugees to leave, with some 350,000 returning home in just the first six months of this year, according to the U.N. agency for migration. “If these Afghan weavers leave Iran, I am certain that production of hand-woven carpets will come to an end. I have no doubt,” Esfahanian said. Iranian exports boomed after the landmark nuclear agreement went into effect in 2016, lifting international sanctions in return for Iran curbing its uranium enrichment. U.N. inspectors say Iran is complying with the agreement, and European countries are trying to salvage the deal, saying it provides the best means for preventing Tehran from developing nuclear weapons. President Donald Trump was a harsh critic of the agreement, saying it was too generous and did nothing to restrain Iran’s support for militant groups like the Lebanese Hezbollah and the Palestinian Hamas or its meddling in Syria, Iraq and Yemen — none of which was part of the deal. His administration has demanded Iran overhaul its regional policies in return for the lifting of sanctions, while Tehran appears to be waiting Trump out, hoping a future U.S. administration returns to the nuclear deal.